I often help clients do cash flow analyses for their properties. Sometimes I work up the analysis and a custom spreadsheet just for my client’s project. I also use tools and spreadsheets developed by the CCIM organization. 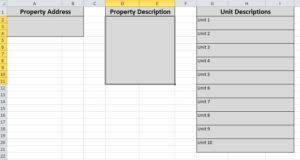 For clients looking for a simple tool they can use as an initial step in analyzing a property, I provide them with this simple Excel workbook. 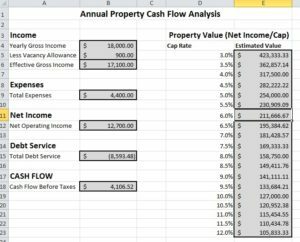 The main use for the spreadsheet is to figure out if a prospective investment property will ‘cash flow’ (Income minus Expenses is greater than Debt Service). In most cases, investors want positive cash flow. For some properties, they may be willing to put up with a small negative cash flow before taxes. The spreadsheet can also be used for comparing property values. All other things being equal (which admittedly they seldom are) the property with the highest cap rate for a given price is the better investment. This worksheet provides instructions for using the workbook. The worksheets are password protected to prevent modifying the formulas. This should not prevent you from using the workbook. You can update all the columns you need. This worksheet provides a place to describe the property. There is a place for the property address, a place for a description of the property, and a places to describe each type of rental unit. 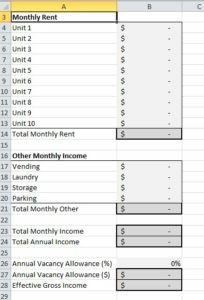 The Income Analysis worksheet provides sections for entering monthly income for up to ten units (if there is only 1 unit, like a single family home, only enter a value in one of the cells). If you have multiple units that have the same rent, you can enter the total monthly rent for all the units in one entry. If you have other income from the property, such as from laundry rooms, vending machines, or extra storage, enter that information in the appropriate rows. Finally, enter in your estimated vacancy allowance (the percentage of time each unit will be vacant over the course of a year, on average). 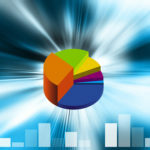 From this information, total monthly income, total annual income, and effective annual income are calculated. The total annual income,annual vacancy allowance dollar amount, and effective gross income are automatically transferred to the Property Cash Flow Analysis worksheet. 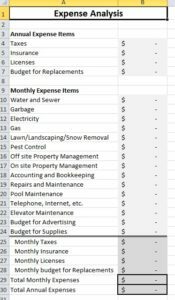 The expenses worksheet has an area for entering Annual Expenses, like taxes and insurance so you don’t have to figure out the monthly amounts ahead of time. Along with the Property Address the Income section, which shows the gross yearly income, the vacancy allowance, and the resulting effective gross income. The gross income and vacancy allowance are pulled from the “Income” worksheet. 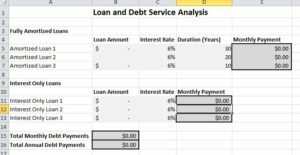 The next section shows the Expenses, pulled from the “Expenses” worksheet. 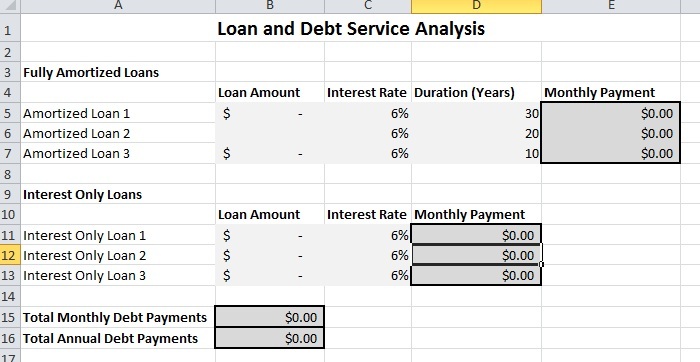 The next section of this sheet is the Debt Service section which pulls the total annual debt service from the “Loans and Debt” worksheet.